Why do dogs and their woners, both social animals, often have problems? As a practicing veterinarian, Dr. Milani found that many owners fail to understand the meaning of dogs' behavioral displays. By mistaking territoriality for spite, dominant behavior for love, and making other false interpretations, owners often respond inappropriately. Many owners also fail to grasp how their own emotions and body language affect their relationships with their pets. Here, based on fascinating case histories form her own practice, Dr. Milani offers a guide that goes beyond solving dog behavioral problems. 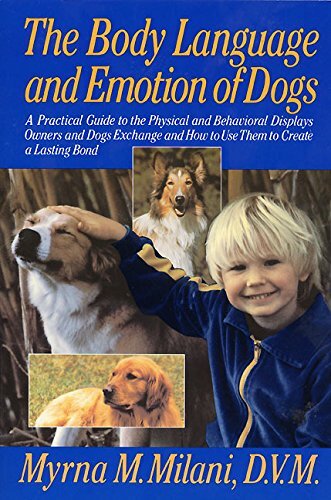 The Body Language and Emotion of Dogs also explores the powerful emotions aroused in those of us who seek satisfactory bonds with our pets. Understanding both the social nature of dogs and also that our own emotional responses enhance the physical, mental, and emotional health of both owner and pet. Dr. Milani uses fact, practical experience, and above all, sensitivity and tolerance to help owners build better relationships with their dogs. If you have any questions about this product by William Morrow Paperbacks, contact us by completing and submitting the form below. If you are looking for a specif part number, please include it with your message.